Gilder Group has expanded its iconic Rotherham garage by adding a Mitsubishi dealership to its operation. Based at the landmark Mushroom Garage on Doncaster Road, the new dealership is part of the Gilder Group, a family-run dealership group that was first formed in Sheffield by William Gilder in 1938. Employing more than 70 people across the company, there are two other dealerships in Chesterfield and Sheffield and 18 people employed at the site in Rotherham. A Mitsubishi dealership is also opening at its existing site in Chesterfield in February. Bradford-based JCT600 acquired Gilder Group, including its Volkswagen dealership in Wickersley, Rotherham, in 2013, but outgoing CEO Garry Scotting retained the Gilder Honda sites, including the dealership at Mushroom Garage in Rotherham. 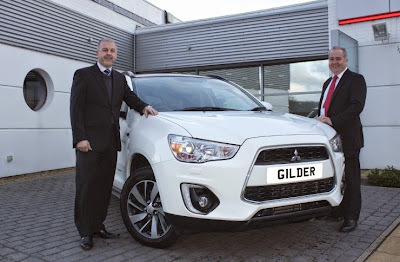 Darren Stolz, sales manager at Gilder Mitsubishi Rotherham (pictured, left), said: "Gilder Group has been going for more than 70 years now and we are confident that our excellent reputation, together with Mitsubishi's fantastic range of vehicles, will make this a successful partnership. This is a very exciting time for everyone at Gilder and we are really looking forward to opening with Mitsubishi." Lance Bradley, managing director of Mitsubishi Motors in the UK, added: "We are really pleased Gilder has joined the Mitsubishi family and we wish them every success. The Rotherham dealership is based in a local landmark and the team are well known in the area for delivering great customer service, which is something that is vitally important to everyone here at Mitsubishi." With 18 new Mitsubishi dealerships opening in 2014, the company saw sales growth in passenger cars of 75% compared with the previous year, against an overall market up by 9.3% according to year-end sales results released by the Society of Motor Manufacturers and Traders (SMMT).